Students at Hayes and Webster started a new recycling program last year through the Terracycle company. Empty CapriSun or Honest Kids juice pouches (straws can be included) or empty Entenmeann's Little Bites wrappers can be brought to school and placed in collection boxes in the following areas: the main lobby, outside of the art room, or the lunch room. We earn points through the program for free materials. Most importantly, it keeps A LOT of wrappers out of landfills. ​We also collect dried up markers of any kind and ship those free of charge to the Crayola company. We do not earn anything through this program, but the Crayola Colorcyle program turns old markers into usable energy! What a great program to be a part of! Webster and Hayes Elementary schools are currently participating in a unique art fundraiser opportunity. This is the second year for Webster and the first year for Hayes. A work of art was created in art class and was shipped to the Square1 Art company. 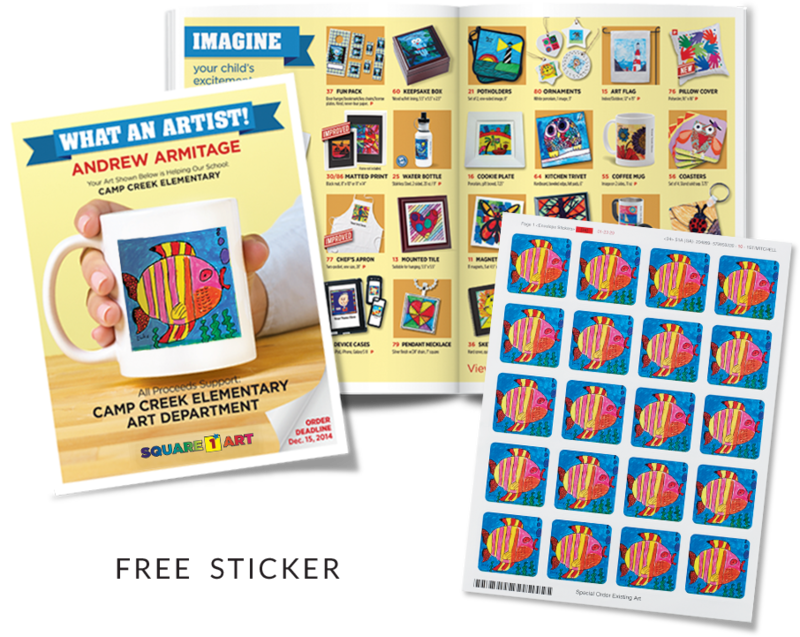 The Square1 Art program fundraiser gives every student a free gift – stickers featuring their artwork – regardless of whether or not the student makes a purchase. By now, students have either received their free stickers and catalog featuring their artwork or will be receiving their packet very soon. There is no obligation to purchase anything, but the stickers are yours to keep! Funds raised will be used to purchase unexpected items for the art room needed throughout the year that are difficult to order through a catalog in a short time period. For example: Foil, plastic wrap, ziploc baggies, specialty size containers with lids, playdough, air dry clay, special papers, extra paint, balloons, jewelry making supplies, ceramic supplies, glue gun refills, glue, glue sticks, beads, permanent markers, etc. (I make a lot of quick runs to the dollar store)!! We would also like to purchase some nice glazes and higher quality items that are just not in our school budget. The students have created art that they are truly proud of. If you are interested in making a purchase, you may do so by ordering online, or sending your order to school with your child. You may send cash or checks made out to Square1 Art. Please label the envelope with my name. Did you participate in the Hayes Trunk or Treat this year? This was my entry from last year. Afterwards, in art class we created Canopic jars of Bastet cat heads using Pringle cans for our Team Cat vs. Team Dog theme in art. My ten-year-old daughter Carmen made me so proud when she agreed to dress up as Mexican artist Frida Kahlo for Halloween. She was even able to master the unibrow all by herself for her school's Halloween parade!